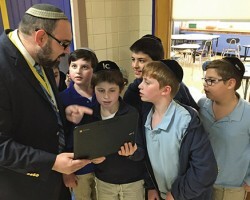 The JEC Lower School has taken on the task of teaching middot and halacha through Torah Live, a multimedia platform that provides presentations on Judaism for adults and children. The videos provide a platform for engaging the students in areas of middot and halacha in a modern, innovative and engaging manner. When questioned about their use of Torah Live, students in the fifth grade boys class clamored to respond enthusiastically and were quick to answer questions on hilchot Shabbat that they obviously absorbed in a meaningful and relevant manner, thus proving Rabbi Pietruszka’s claim. “It’s been a great start and we hope to continue to expand the program in the future,” he said.